I wonder if I should find something else to call these besides "eye of the day" because I rarely post them on the same day I wear them. Maybe... eye of two weeks ago? Doesn't have much of a ring to it. Maybe it's just a look. An eye look. I dunno. Still feeling under the weather and have no energy to swatch new stuff or edit photos. I would love to post the Orly Cosmic FX polishes but I'm just too exhausted! 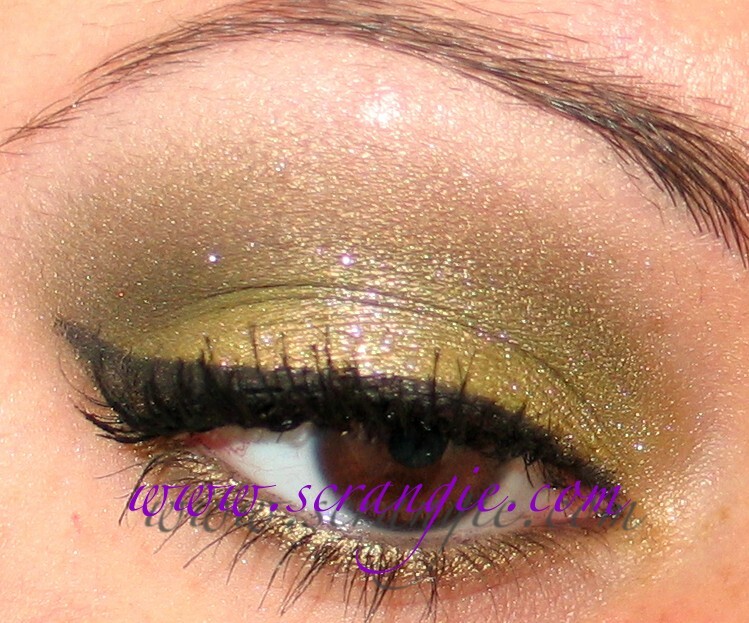 So, here's an eye look I did a few weeks ago that I thought really made my eye color look nice. See?? Doesn't it make my eyes look really brown? I think they look fabulous. 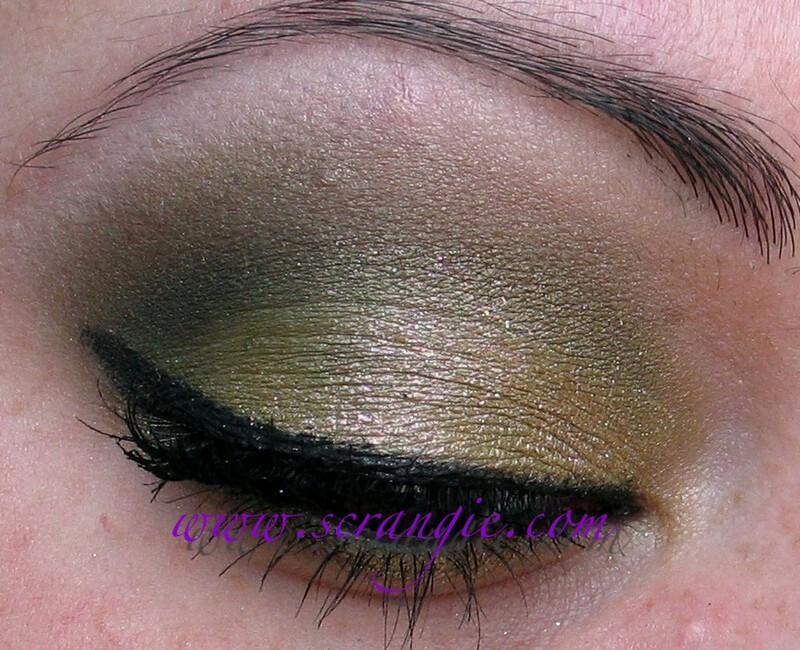 I love green eyeshadow on my eyes because it seems to bring out the color and make it look rich and golden instead of just black like they normally look. However, green doesn't always mesh well with my skin tone, it seems to bring out redness or weird yellow/orange tones. Same thing happens with green polish, too. However, I love green so it rarely keeps me from wearing it. This combination wasn't bad on my skin. Pretty close to perfect. Leopard-Print Galaxy is spectacular. It shifts colors at different angles and it has lots of little iridescent sparkles. I'm addicted to these Fyrinnae Arcane Magic shades, they're so fun and interesting! Despite the complexity and sparkle of Leopard Print Galaxy, this was still a fairly subtle look. This looks gorgeous on you! 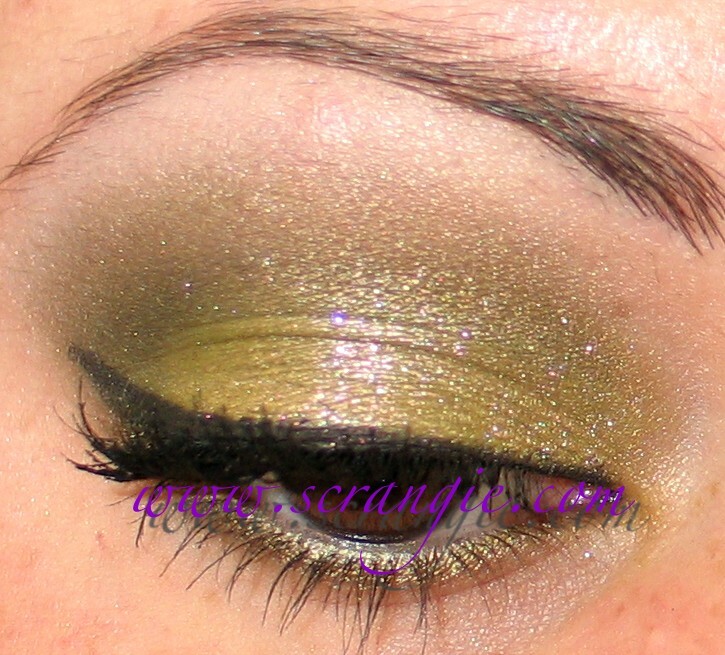 I would love to wear green eyeshadow, but it doesn't do much for my green eyes. Love greens for brown eyes, it brings out the amber tones in mine :) I have similar problems making green work for me :/ I usually just use them as accent colours. I love this on you! Green and I are best friends - I have yellow tones to my skin so any green is really flattering on me. I need to get some of the shadows you are using. Scrangie = queen of the lemmings :)! I love it! Your eyes look really "milk chocolate" brown. Great look!I also have brown eyes and have the same problem as you in terms of good eyes/generally looks weird with my skin. This look is beautiful though! I love that there are little flecks of glitter to that aren't overpowering! Subtle and I love it! Wow! It works really well. woah, I'm in love with these purple (?) sparkles with green! Really beautiful. Wow - great look ! Love it! The photos turned out really good too. I can never get clear photos! You should do more!!! Very pretty. Would you please do an eyeliner tutorial? I love how you apply yours. I love Leopard Print Galaxy. It's fantastic. Wow! the color is so rich, awesome! Really lovely, the colours look great on you. I love olive toned shadows on my brown eyes. They seem to make my eye color richer and golden also. Love this look. One of my favorite looks for everyday. Hope your feeling better. Your eyes look spectacular. Super pretty! And EOTD I think is better than Eye of Last Week or whatever hahahaha. I was wondering if I could make a request for comparison though as I have to order everything online. How close are ChG Zombie Zest and Orly It's Not Rocket Science? And how similar are ChG Watermelon Rind and ChG Ella Zitzgerald? p.s. And can anyone really tell me what's the wear time on Zoya Mattes?